It’s well worth paying more than the minimum for these tours as there is quite a range of quality of boats taking passengers around Halong Bay. We heard horror stories of people who couldn’t sleep at night because of rats running inside the walls of their ship. For this reason we selected a tour with Handspan Adventure Travel (80 Ma May, Hanoi). The price was $77 US per person travelling on a small and very comfortable minibus with an excellent guide to Halong Bay where we boarded the Dragon’s Pearl for a one night cruise around the islands. The whole trip was first class and we cannot recommend them highly enough. Halong Bay Sightseeing and Activities The main attraction of Halong Bay is the stunning limestone karsk scenery. The moment you’re ship sets sail you’ll be snapping away with your camera but don’t worry there’s no rush as the scenery just gets better and better. Besides the magnificent views, visitors come to explore the caves in the region which can only be accessed from the charter boats. The Handspan Tour included a visit to Hang Sung Sot cave which has three beautiful chambers of stunning rock formations including a famous fertility symbol. 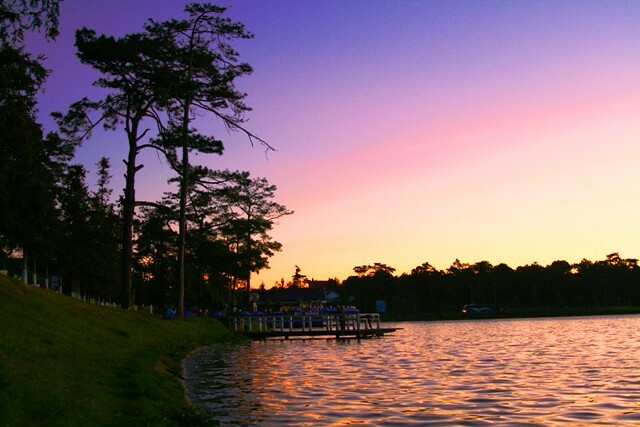 Introducing Xuan Huong Lake in Da Lat – Those who go to Da Lat mustutter that: wow! How beautiful Da Lat is! Ravishing the travellers,beautiful even in the heart of people who have not ever been to Da Lat. Were people love Da Lat by whirl of series of waterfalls, smog illusion of fragrance and cool water of XuanHuong Lake. Around XuanHuonglake, there are pine forests, laws and flower gardens. 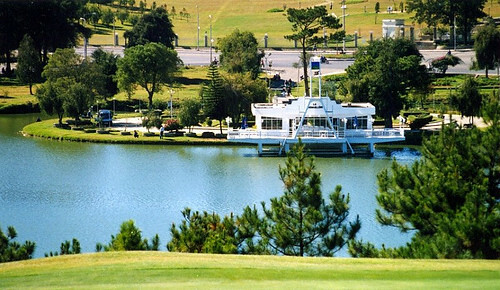 This is places that tourists like stroll or carriage when visiting Da Lat city.XuanHuong Lake is an artificial lake, about 5km in circumference. The lake is shaped like the crescent moon with nearly 7km passing many tourist destinations such as city flower garden, Yersin Park, Doi Cu. Lake is upstream of Cam Ly waterfall, the heart of Da Lat city and one of the rare cities which have the lake located at center. It is not only famous toponymbut also tourist destination quite interesting that creates the character for Da Lat. Prominent architecture in association with XuanHuong Lake is Thuy Ta.French colonial period called “La Grenouillère” (Frog marsh). Do not understand why it has this name but look through this structure, there is a tower to jump into the water as pool.Sino-Vietnamese name “Thuy Ta”, sometimes also interpreted as “Thuy Toa”, which means that an architecture located on water. A few visitors ignore Thuy Ta. Visiting here to take some souvenir photos with architectural forms are very different, hard to find place that has similar architecture. Awhite house with wide handrail stands out on the lake. Looking appear for a moment like a luxury yatch. Up to now, Thuy Ta is still a small coffee bar, pretty.If you want to build a place to meet a large number of visitors,it is also feasible to build. 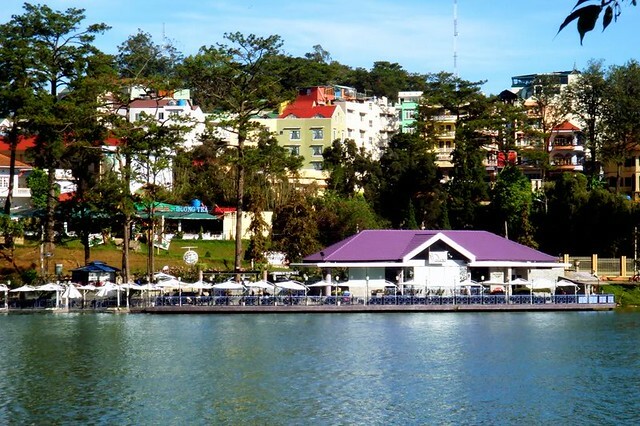 Perhaps because Thuy ta image was attached to XuanHuong Lake, deeply etched in the minds of Da Lat people and tourists and the government has no intention of this.Even white architecture also always be kept unchanged. To meet customer demand, the opposite side, the other coffee bar is open.It is “ThanhThuy”. The name (green water) is also associated with the XuanHuong Lake. In here, the space is wider. Going to Thuy Ta and ThanhThuy to drink coffee mainly contemplate the surface of the lake. For that reason, Thuy Ta still has special characteristic which is not mixed with ThanhThuy. But the psychological feel when sitting on Thuy Tais still something peaceful, serene. In ThanhThuy, the landscape is more diverse but the atmosphere is more bustling. People who sitting to watch the lake feeling less private when in Thuy Ta. Visitors going to XuanHuong Lake can also participate in a very exciting game. This is pedalo, pedal freely your foot into the water to feel the cool elegance of pine city. If on the bank, visitors can photograph while riding horse to save private tour for yourself. In the evening, the visitors can hide double bicycle or sit on carriage to go around the lake. 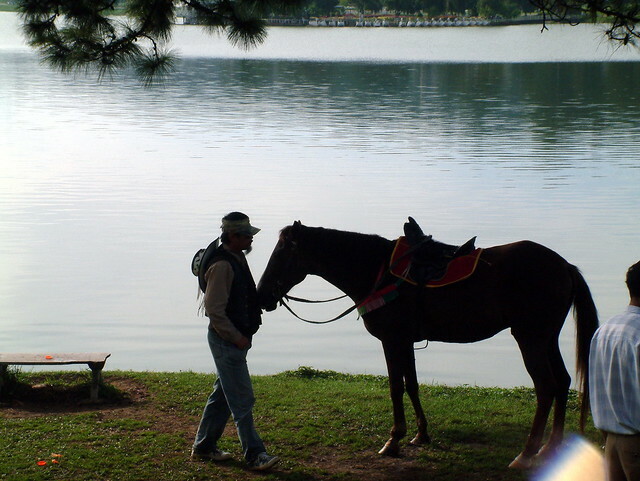 This entry was posted in ASIAN TRAVEL and tagged Asia, Asian Travel, Things to do in Dalat, Viet Nam Travel Guide, Vietnam Travel and tagged Best Vietnam Travel, Xuan Huong Lake in Da Lat on October 7, 2014 by mienphi.